Did you look down into the whorls, to see if there is anything forming?? I'm not giving up yet. Freezer Pig wrote: Did you look down into the whorls, to see if there is anything forming?? boudreaulicious wrote: I need a ladder!!!!! My luck, I'd snap the stalks off!! Obviously it's sideways but you get the idea. Even fuller one popping out of the slightly taller stalk next to it but too hard to snap a shot of that one yet. So now what, corn guru??? Katie wrote: Ha ha ha! Congratulations! Well thank you! I feel very proud. This must be a bit like you'd feel when your kid graduates kindergarten or something LOL!! Wooo Hooo!!!! Your first tassel!! 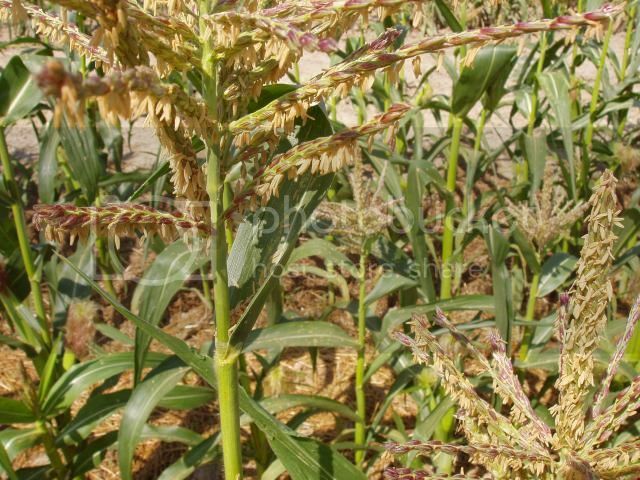 That feeling you had when you found it, is the same feeling even the biggest farmer gets, when they find tassels. It's a sign that things are on their way to being OK. Just imagine that feeling, if you had a few hundred acres of corn and you were depending on it for your livelihood for the next year. boudreaulicious wrote: So now what, corn guru??? You'll get silk in a day or three, depends on the variety, and I'm sure I'm not familiar witht that stuff. Pray for warm but not hot weather, for the next two weeks. Dew is good, rain is ok, as long as it's not every day. Don't mess with the silk. If you had a whole field, I'd tell you to feel it (it's sticky). 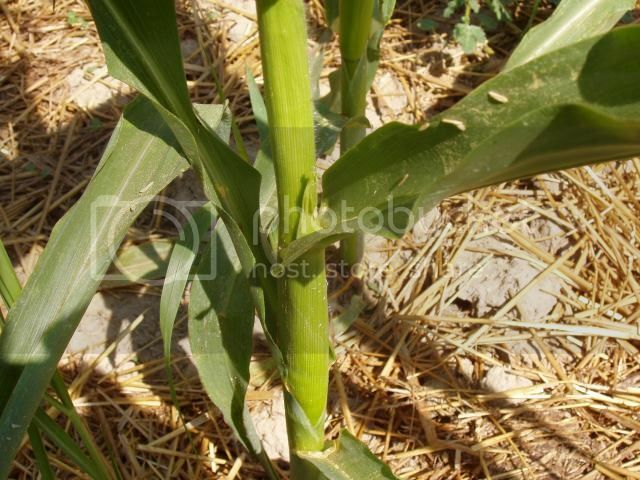 Since you only have 6 stalks, you can't afford to crimp your yield. It needs to stay fluffed up and sticky, if you go messing with it, it'll be all globed together and the pollen won't be able to do it's thing. You'll see pollen stuck to the silk as nature takes it's course. Maybe give the stalks a little shake, a couple of times a day. You want as much pollen hitting that silk as possible. Big wind/breezes will not be your friend with 6 stalks. Keep it watered like you have been, the leaves I can see look like everything is good. You are on your way!! You really are a farmer. Freezer Pig wrote: You really are a farmer. Considering the source that is truly a wonderful compliment. First ear shoot. This is probably day 2, I didn't look too hard for a younger one. They grow fast. First silk, sometimes it'll blow silk before you can even see the ear shoot coming. You'll be surprised how fast that's all going to happen. Sometimes, if you get a nice rain at night, followed by an 80 degree sunny day, a field can go from nothing to almost full silk before the sun goes back down. I/we are waiting for the next stage of growth and pictures from your balcony field. I can fully see the tassels now for both the taller ears. I think we're hoping for some rain + 81deg on Sunday--fingers crossed!!! I'm interested to see how many ears each stalk will have. 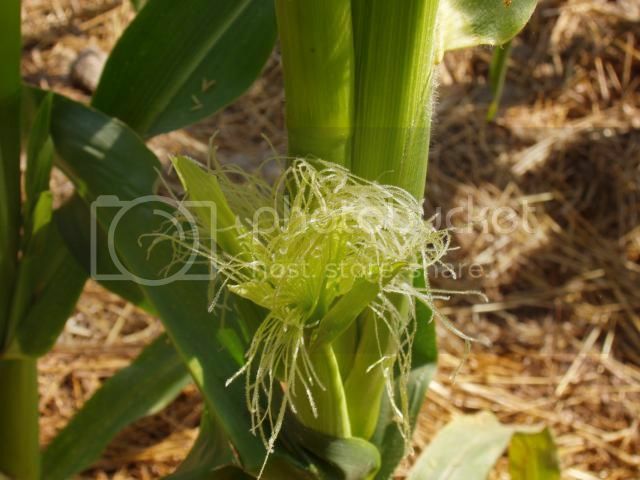 Field corn and sweetcorn normally have one ear per stalk, popcorn will have two or three. 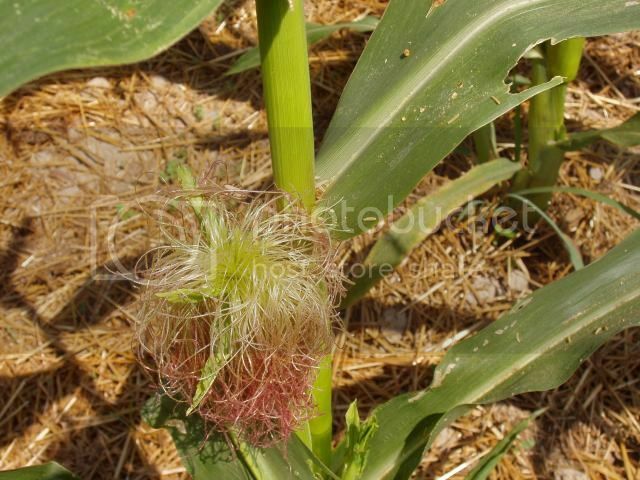 I've read about Gem Corn (or whatever it was called) in another post here, it looks like popcorn kernals, so I wonder if you'll end up with multiple ears. If you end up with a bumper crop, I'd like some seeds if you can spare them. I'll grow them in the garden and return your seed plus some, if they make a crop. I'll find something to trade you. You're gonna be a mess by the middle of October. Remember, patience is a virtue. hehehehehe...I can handle it. I'm not expecting much It's too tall for me to see anything anyway!! Enjoying all the purple/black tomatoes. Hoping to start pickling the long beans tomorrow. And the first bag of potatoes (small haul but nice looking). Hi- You have more tomatoes in your garden right now than I do in mine. All I have picked so far are a few Juliets and some Sun Gold. Are those Black Cherry tomatoes? I had one ugly black tomato I picked in my garden on Monday, and I forgot about it, and when I decided to use it on Tuesday it had mold all over it. I am going to try to go to my garden today, and see if I have any Black Cherry tomatoes finally. I should have some more sun gold ready to pick. Today when I was at the Evanston market, I talked to one of the organic growers that puts their #2 heirlooms on sale, and on a few occasions when they are getting ready to go home, they will give them to me for free. I asked them today if they had any heirloom tomatoes, and I was told that they had some cherry tomatoes earlier, but they sold out on those. They told me their heirlooms won't be ready for another two weeks. I planted some pole beans in my garden, but unfortunately some animal eat the plants. I am not sure if it was a deer or some other animal. Deer love bean plants. It's been a week..... no pictures of pollen laying seductively on silk?? Ask and ye shall receive! And I'm sure I could use some counseling right about now--completely unsure what should be happening at this point. I do know that I 'm going to do this differently next year. I'm going to put the corn where my potatoes and carrots are now I think--it will serve the purpose of creating a barrier with my next door roof neighbors (the pizza place with the VERY loud air compressor!!) and enable me to have a row which I don't now (I have one pot on the ground and two with smaller stalks in pots). Anyway, have at it!! Last edited by boudreaulicious on August 15th, 2014, 9:50 am, edited 1 time in total. I'd say just make sure there is pollen on the silk. Not much else you can do. It'll take water to make nice kernals on the ears, but you don't have to go crazy, just keep doing what your doing. 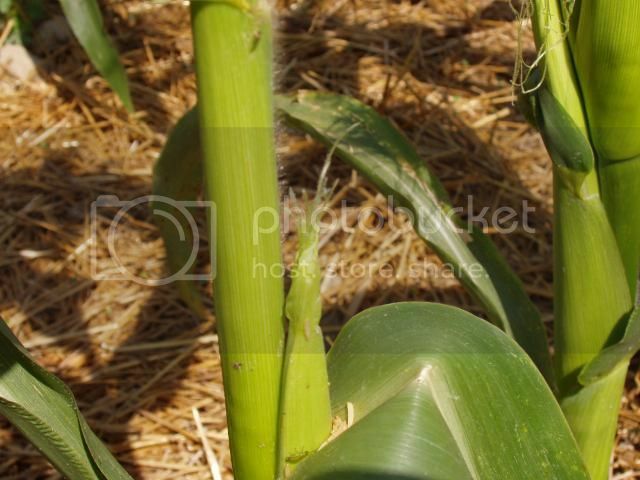 Maybe give the stalk a little shake once in a while, if it's calm, to see if you can get the pollen to fall on the silk. You are pretty much at the whim of nature at this point. You have everything invested, just have to wait and see. 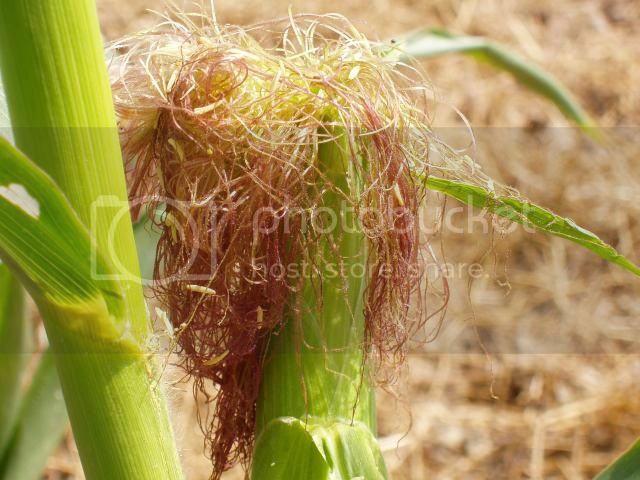 Laughing so hard at the thought of going to La Columbe and finding ANYONE interested in talking about my roof corn!!! We've actually had some pretty windy days, followed by dead calm this week. The plants are well-watered (we've also had some great rains) but it's getting pretty cool here. I won't be sad if it doesn't work--but will certainly be thrilled if I get an ear or two. boudreaulicious wrote: Laughing so hard at the thought of going to La Columbe and finding ANYONE interested in talking about my roof corn!!! I have a feeling that Jonathan @ Bad Wolf would be pretty willing to have you bend his ear re: balcony gardening. That's what I have all of you for!!! For some reason, I thought you had silk before. I told you those come on fast. It'll be a couple days before that's ready to pollinate, if that's the first ones.